Along with the rain we have received in the last month or so, we have also started seeing bloat in several open range herds in the past few weeks. 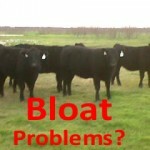 Saving just one steer from bloat will more than pay for one ton of custom blended mineral to combat the bloat problem. And at just 10.4 cents per head per day, that’s pretty good insurance.